One friend from Sesame Street, plus one friend from Sesame Street, equals two friends from Sesame Street! Ah, ha, ha! Are you or your family friends of Sesame Street? Do your kiddos spend Count knows how much time in front of the television, singing with Big Bird and horsing around with Elmo? Are you a huge fan of the Muppets? Or perhaps your friends need an addition to their Sesame Street gang this Halloween. However you happened to stumble upon this dashing costume, we're glad you did. 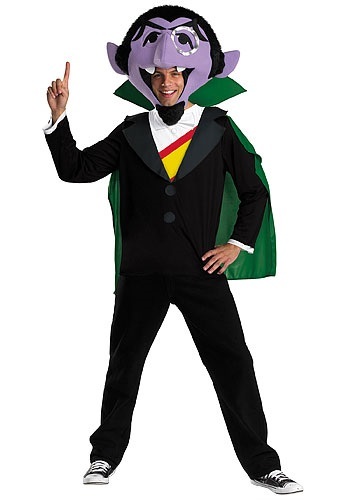 It includes one—count it, one—jacket/shirt combo, one cape with a single foam collar, and one fabric headpiece, which really completes the image and sets you apart from the less... benevolent vampiric creatures that go bump in the night this time of year. If you add all that up, it equals one stellar costume that will steal the show around all ages, wherever you go. You can count pieces of candy at your front door, pints of beer at your favorite pub, and weird looks at the grocery store! And keep in mind: if you have arithmomania (compulsive love of counting things), this is the costume for you. If he weren't a vampire, Count von Count could have made a great accountant, and if you weren't such a great judge of Halloween costumes, you could be looking elsewhere! Good for you!